How to extend your growing season with a Hoophouse. When the weather turns cold, many gardeners think it’s time to pack it in until warm weather returns. 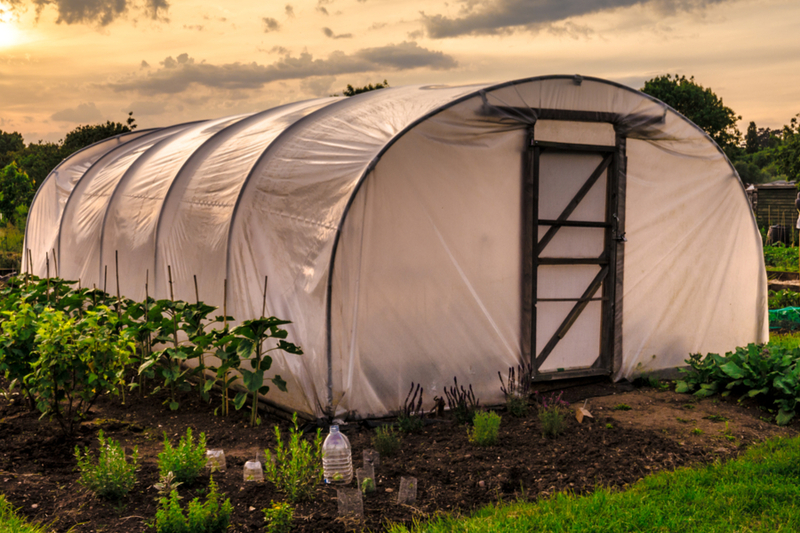 Although its true that a hard frost or freeze can stop vegetable plants in their tracks, a hoophouse can protect plants and extend the growing season well beyond traditional norms. That means fresh vegetables earlier in the spring – and well into the first snowflakes of winter. A large or even mini-hoophouse is a great way to extend the growing season. In fact, some use these mini-greenhouses to grow all winter long. They are perfect for cool weather crops during the coldest months. And what home gardener wouldn’t love a fresh salad in the middle of winter! A hoophouse is a greenhouse that uses plastic sheeting in place of glass to trap and hold heat. The frame is made up of a series of hoops created from either plastic, metal or wood. This type of skeletal framing is inexpensive to create, and easy to set up and take down. Hoophouses can have their frames constructed of plastic, metal, or even wood. The hoops are anchored to the ground, or in some cases, to raised beds. They are then covered with a layer of clear plastic sheeting clipped into place. The plastic covering works by absorbing the sun’s rays during the day to heat the interior. It then traps the warmer air inside during cool nights allowing plants to continue growing. In addition to thermal protection, a hoophouse provides additional protection to plants as well. These mini-hoophouse frames are placed on raised beds. The plastic covering aids in retaining moisture, requiring gardeners to save on watering chores. They also protect crops from damage due to high winds and heavy rain. And if that wasn’t enough, the covered mini-greenhouse can also be a big help in keeping away insects and pests from stealing a harvest. That can actually be a big plus in the early spring or late fall. It’s a time when many animals are searching for any food source, and fresh vegetables are an easy target! One of the best things about a hoophouse is they can be inexpensive to purchase as a kit, and even cheaper for those willing and able to build their own. They come in a variety of sizes. From from 8′, 10′ and 12’+ full-height kits, to smaller 2 to 4′ row-cover styles that are perfect for growing greens. They can also be attached easily to raised beds to create an instant mini-greenhouse right in the garden. Here are a few styles below that can fit almost any home gardener’s need. Floating row covers with support hoops that are great for frost protection and seed germination. This mini hoop house kit has an arch height that can be adjusted from 27″ to 40″. This kit is perfect for growing cool-loving greens deep into the season. It would also work well for attaching to raised beds. This 15′ walk-in style hoop / greenhouse is great for those looking to get a little more serious with cool weather growing. The heavy zippered door helps to keep heat in and the 7′ height is perfect for standing up and working. For more cool-weather growing, check out our article on cold frames : Growing With Cold Frames. This Is My Garden is a garden website created by gardeners – for gardeners! August 11, 2018 TIMG Comments Off on Growing Garlic – How To Plant Hardneck Garlic This Fall!